Currently, deepwater operations are completely reliant on shore-based supply bases. The further operations shift offshore, the greater the costs, delays, and risks. With ‘peak oil’ a reality, there is an increasing reliance on offshore production as majors scramble to replace reserves and offset production decline. 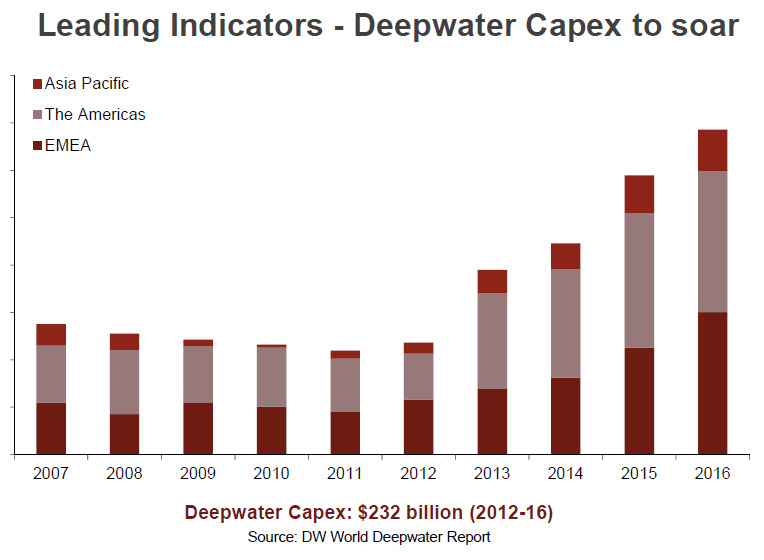 Notably, deepwater production is predicted to grow 99% versus shallow water growth of 20% over the next 5 years. As exploration and production activities move further offshore, onshore supply bases face significant challenges to service operators in a timely and cost-effective manner. Increasingly, the distances involved are translating into vessel steaming times to operations of over 48 hours – with considerable cost and risk implications when repairs or emergency response actions are required. Floating ports allow operators to reduce vessel charter costs and achieve greater reliability and assurance of supply. With daily charter rates for PSVs as high as $50,000 per day, reducing the distance between the rig and the supply base results in considerable cost savings. By locating services much closer to the rig, operators and service providers can achieve greater reliability and reduce NPT with workshops, repairs, critical equipment all available in-field. Плавучие порты FiSH® позволяют располагать вспомогательные объекты максимально близко к месту добычи ископаемых, что значительно упрощает и ускоряет доступ для судовладельцев и обслуживающих компаний. организуются полноценные мастерские и хранилища. Ограничения поставок в разные части света вынуждает разведку и добычу ископаемых продвигаться все дальше и дальше от берега, в более опасные зоны. При соответствующей организации разведки и добычи возможно снижение операционных расходов за счет сокращения затрат на 20–30 %.